SOLD! - 1964 Chevrolet Corvette Stingray Convertible - Daytona Blue / Blue Leather - 4-speed -37k miles - Thank you A. H. from Los Angeles! 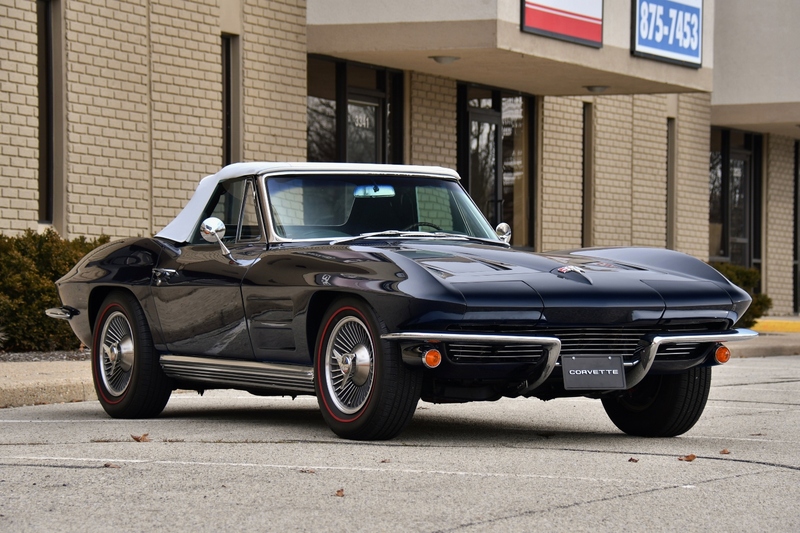 To many people, the C2 Stingrays from 1963-67 represent some of the most desirable Corvette models. Ergonomics, power, and handling were all much improved from the previous generations, and combined with stunning good looks, it proved to be a winner! This beautiful example is in code-correct Daytona Blue with blue leather interior and white convertible top. This is a rare color combination. Less than 1% of 1964 Stingrays were made with the blue leather interior. This numbers-matching car originally came from California. The drivetrain is an "RF" (327-cid 375-hp V-8 with 11.0:1 compression ratio, manual 4-speed transmission, and fuel injection). The original owner removed the mechanical fuel injection and replaced with a 4-BBL carb, essentially making it equivalent to the "RE" engine with 365 hp. The carb is much easier to maintain and keep running properly. However, some of the original fuel injection parts come included with the car should the new owner want to revert back to it's original state. The car has an aftermarket AC system and power brakes.